Interchange is a plugin to bring simple and easy trading to Sponge. 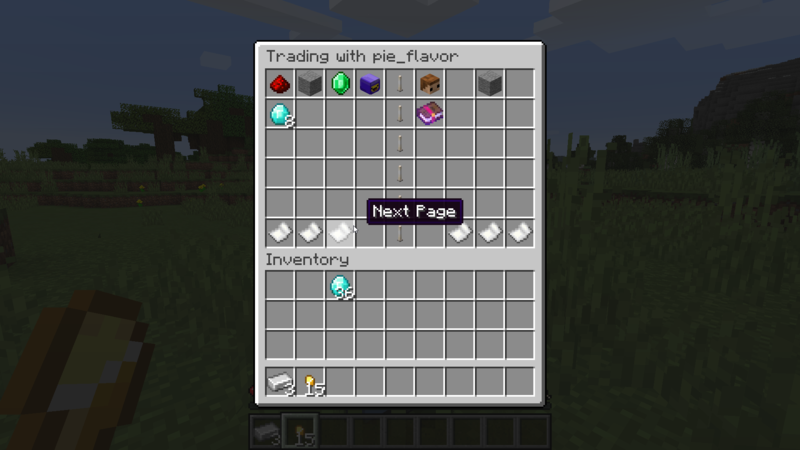 With an easy inventory menu, players can trade items and money in a Steam-style two-stage trading system. /trade request <player>: Request that <player> trade with you. /trade accept <player>: Accept a trade request from <player>. /trade cancel <player>: Cancel a trade to <player>. /trade decline <player>: Decline a trade request from <player>. Once a trade has been accepted, players can now add items to the trade through the inventory via /trade open <player>, or through /trade add hand <player>. If you have an economy plugin installed, you can also add money to the trade, via /trade add money <player> <amount> [<currency>]. If you’re offline when important things happen, you can see what happened while you were gone with /trade notifications. Through the GUI you can set yourself to ‘ready’, and once you’re both ready you can each confirm the trade. If one player is offline when this happens, or if their inventory / economy account is too full to accept the trade, then they’ll be held for a few minutes while you run /trade claim money or /trade claim item drop|give. The configuration is very simple. default-claim-timeout-minutes is the default number of minutes before unclaimed trade items/money disappear, and default-drop-item-claims-on-timeout is whether items drop (as opposed to being voided) when this happens. Both of these can be overridden per user or group by setting interchange:claim-timeout-minutes or interchange:drop-item-claims respectively through your permission management plugin. Appreciate tools like this? Wish there were more? Consider donating!